The EAA founder and tutor Sue Bird is a FE trained South East Leicestershire artist, sculptor and designer, who also teaches design, art therapy and meditation. Sue's pictures and bronzes form nationwide collections, of mixed media equestrian illustration, pastels, oil painting and sculpting (to full size). Design background includes winning Royal Society of Arts Ceramic Tile (Pattern) Design in 1976, and Commendation for Tableware (Pattern) Design in 1977, and The British Lipizzaner Horse Society (European Logo) Design in 1993. In celebrating the Millennium Sue ran a studio and manège field exposition initiated by the East Midlands Arts 2000 Open Galleries and Workshops week called "Captured Moments in Time", during which the iconography of the unique landscape, the research and illustrations of over two dozen oil sketches were exhibited alongside aspects of classical training (classical riding). The founder and tutor Susan T Bird is an Associate Member of the Society of Equestrian Artists. 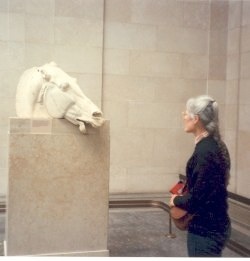 Examples of her two and three dimensional art work may be seen on www.equestrianartists.co.uk - Gallery.